The other day I was getting dressed in the bedroom when I overheard Mike singing in the kitchen. Normally he’s quite a decent singer, but this particular song had him sounding like a dying whale and because I’m a horribly mean person who LOVES teasing him, I had no issues with telling him so. Me (laughing): You sound like a dying whale! Mike (continuing to sing): Whaaaaaaale…whaaaaaaale, whale. Whale you be mine? Only Mike can turn insults into a sweet nothings. If the tables were turned and he told me I sounded like a whale, I would have retorted back, “Oh yeah? YOU sound like a whale!” I’m not the best at comebacks. Nor am I particularly punny, which is sad because I love puns. I wish I came up with a cute and punny way to do take-backsies for making fun of him, but I couldn’t come up with anything so I made him some potatoes to be extra nice. There’s nothing like potatoes and cheese to get you back into someone’s good books. Especially when the potatoes are extra crispy on the outside and soft and fluffy on the inside. 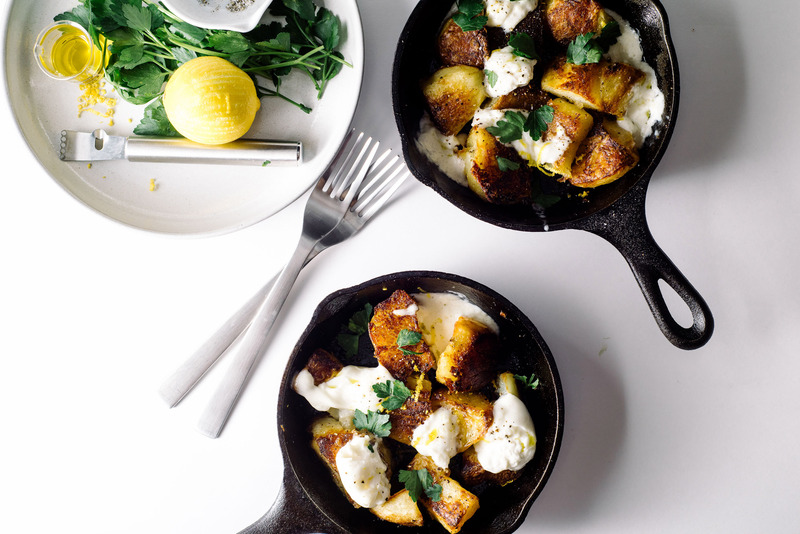 Pair potato crunch with the melting softness of fresh burrata, dust it all off with curls of lemon zest and bright parsley and you’ve got yourself a winner! Peel the potatoes and cut into even 2-inch chunks. Rinse the potatoes and place in a large pot covered with cold water. Bring to a boil and cook for 5 minutes until just parboiled. Pour into a colander and let drain. Shake to roughen up the edges. 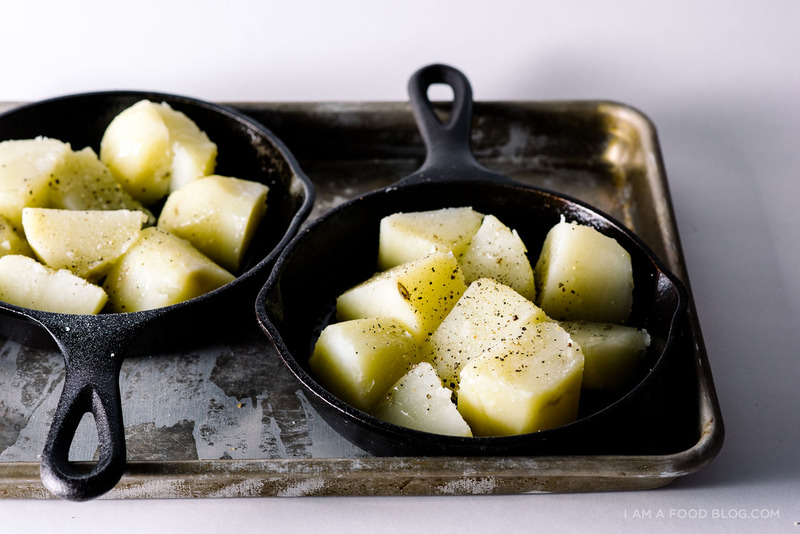 Put the potatoes on a baking sheet or oven safe roasting dish and drizzle with the oil. Season generously with salt and pepper and toss well. Roast the potatoes for 30 minutes until lightly golden. Remove from the oven and gently squish the potatoes with a potato masher or fork for maximum crispiness. Drizzle with extra oil and carefully flip the potatoes. Bake for another 40-45 minutes until deeply brown and extra crispy. 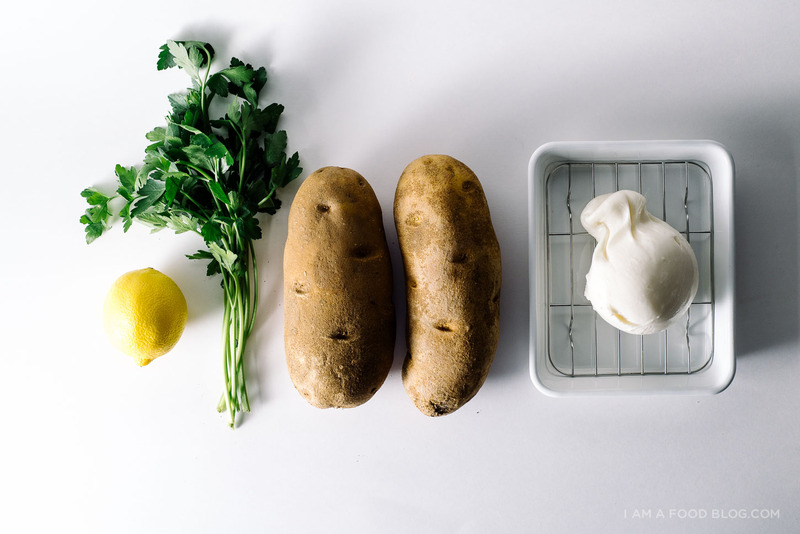 Remove from the oven, top with torn burrata and a sprinkle of salt and pepper, lemon zest and torn parsley leaves. Enjoy hot! 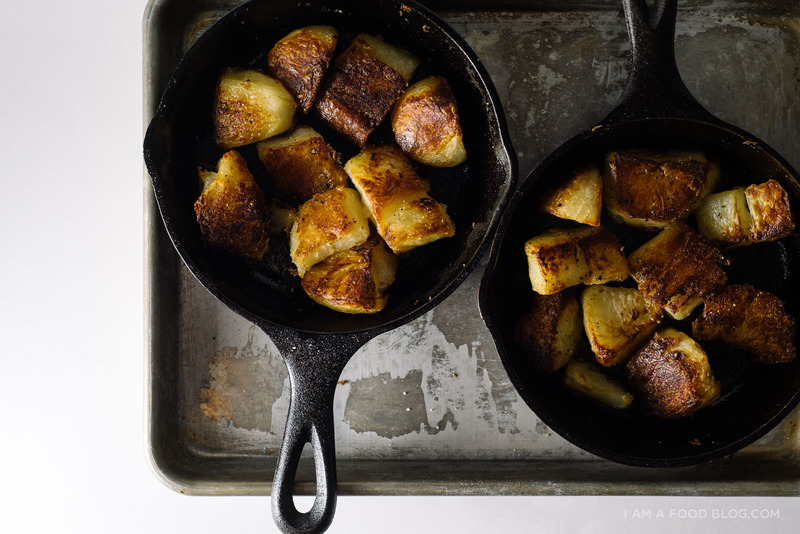 Potatoes inspired by Jamie’s Perfect Roast Potatoes. I love the idea of smashing them and then roasting them again! 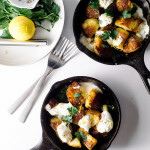 I always have trouble getting my potatoes to maximum crispyness, so I’ll definitely be trying these soon. BAHAHAHAHA “I whale”….you guys are the best! And so are these potatoes. Dang..so crisp! Hehe–your stories crack me up. I thought for a moment he was going to pull a Dory and start whale-wailing in humpback ;) also, I LOVE crispy potatoes. PJ’s and Sunday brunch, here I come! You guys are just too cute. Whale you be mine?! DYING. Bahaha aww you two!!! I love your stories <3 and omg these potatoes! 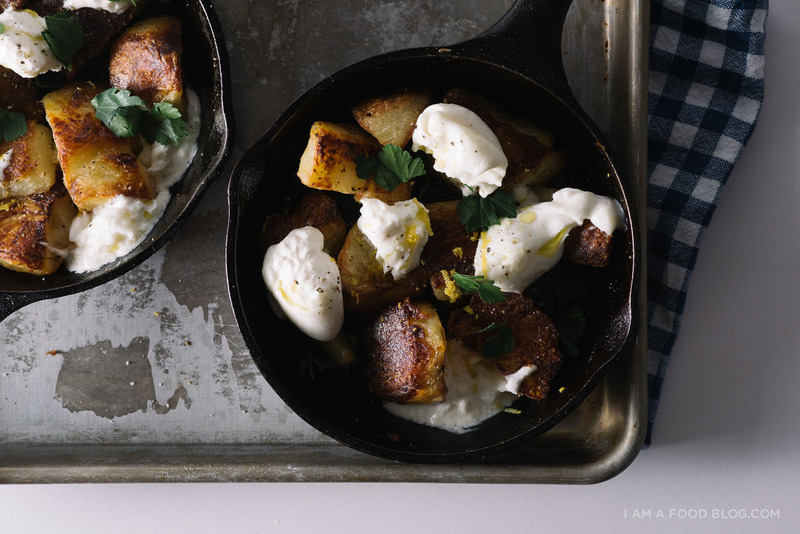 I would have never thought to pair burrata with potatoes — that sounds SO so good! Happy Sunday, friend <3 <3! This looks delicious! I love the little skillets, too cute! You two sound adorable together! 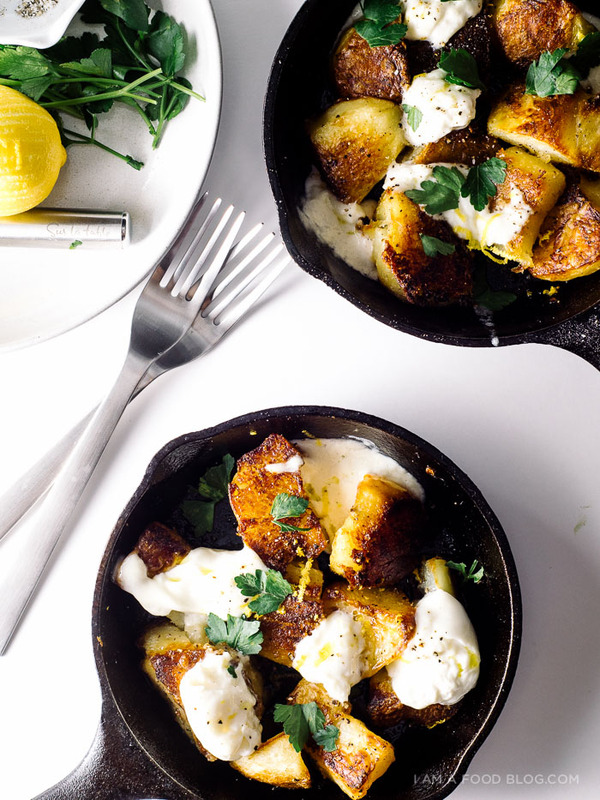 I can’t think of any better way to be extra nice than crispy potatoes! These look amazing. Such a brilliant combination! You guys are the cutest!! 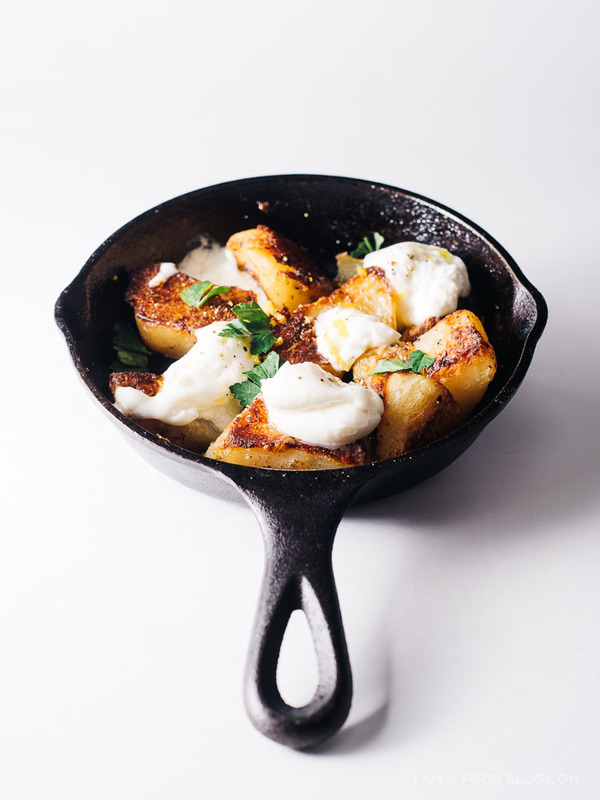 I whale definitely be putting burrata on my potatoes from here on out. Happy Sunday!! Whyyyy have I never had crispy potatoes with burrata before. Amazing how cheese makes everything better! Just looks so mouth watering delicious! Good recipe. Since you love puns , as do I, there is an author who writes a very punny series called the Xanth Series, he is Piers Anthony and there are over 30 books in the series. You are so right about brunch at home! I haven’t found better eggs benedict than in la cucina! My coffee is always hot, the way I like it and the mimosas are bottomless. I’ve been trying to stay away from potatoes and starch but this looks amazing and I can’t way to try them. Yum, Yum! Oh my world! We just had this for brunch this morning. I. Want. It. Again. Now. Thank you, thank you, thank you. Where did you get your hands on Burrata? I live in Toronto and I am not particularly sure where to buy it. I imagine though that my best bet is exploring a cheese shop. cheese shop definitely or whole foods carries it!